The year is coming to a close, and 2017 has been one to remember. First and foremost, we would like to extend a HUGE thank you to all our customers and business partners who have supported us this year. We could not be where we are without you, and we look forward to a continued partnership for the upcoming years. To our staff and business affiliates, you guys ROCK! Thank you for the dedication and PASSION you bring to work on a daily basis. Here is a small recap of the most memorable moments for us at AP Shield in no particular order. What an amazing opportunity it was to introduce AP Shield and our standard of Paint Protection Film installations to Toronto. At the 2017 CIAS we displayed a 2003 Acura NSX fully wrapped with Hexis Body Fence Paint Protection Film and coated with Ceramic Pro. Wide. Fast. Beautiful. What else can be said about this perfectly built Porsche. Check out the write up here on our SunTek Ultra PPF installation. Check out the install here. This must have been one of our most challenging Paint Protection Film wraps. The curves and unibody design challenged us to push our skills and paint protection film to the absolute limits. The owner wanted the House of Kolors Voodoo Purple paint to keep shining and stay paint chip free. We wrapped this stunning Vette with SunTek Ultra PPF. PS…. Did you know this is powered by a monstrous LS7 motor. Madness! SunTek Ultra PPF seems to be the fan favourite when it comes to show cars. This Z28 was no different, just check out the INSANE paint job!!!! Upwards of the $24k mark just for the paintwork, it makes sense why the owner wanted the high impact areas protected with PPF. How the heck do you fix a paint chip on metal flaked hand airbrushed paint job?! At least the PPF will take the beating now. If there is any local event you have to check out in 2018, it will be Cars N Coffee hosted by Engineered Automotive. We are proud to be a sponsor of such an epic car meet. Want more info on Cars N Coffee? Give EA a follow on Instagram or Facebook to see their event dates, usually held the first Sunday of every month during the Summer months. We want to say THANK YOU to all of the amazing owners of Tesla’s that have come by this year to protect their electric rides from paint chips. One thing that I noticed that Tesla owners shared in common, was the pure passion and LOVE for the brand. Also they HATE rock chips on their paint. We cannot wait to start wrapping the Tesla Model 3 and Tesla Roadster in paint protection film. These cars must be one of the ultimate driving machines. 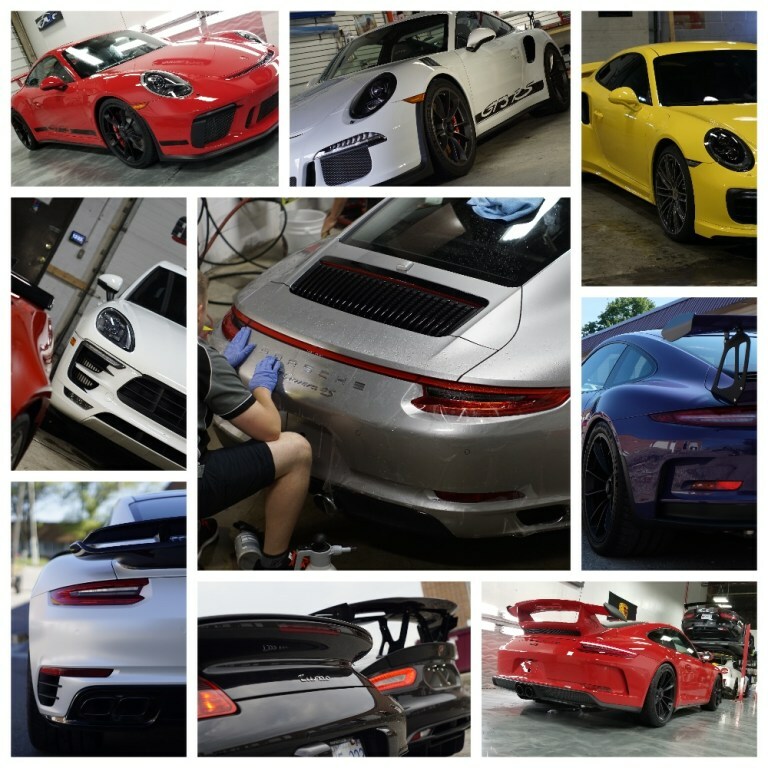 From old school Porsche 964’s and 930’s to the baddest GT3RS’s and GT4’s, Porsche’s must be the funnest cars to work on. Personally, every aspect of these cars is perfect, including the driving experience. Porsche owners share the passion for the cars, and must be one of most loyal brand enthusiasts that exist. Paint chip protection is high on the owners minds and wrapping the very bubbly bumpers isn’t exactly easy. But our experience on these cars makes it looks easy, and we are happy to provide flawless installs time after time after time. Once again, we thank you all for 2017 and look forward to what 2018 has to bring.